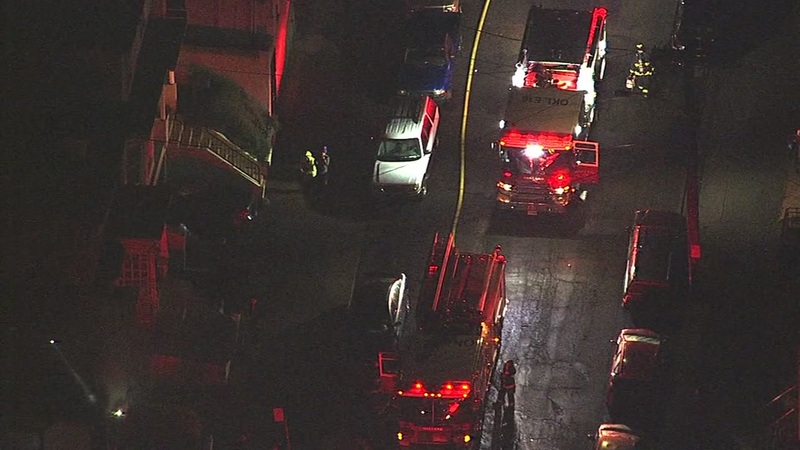 OAKLAND, Calif. -- Oakland firefighters rescued two men from a fire in a four-unit Victorian apartment building east of Lake Merritt early Wednesday morning, according to fire officials. At 6:13 a.m., fire crews responded to the building in the 400 block of East 19th Street, Oakland Fire Battalion Chief Zoraida Diaz said. The one-alarm fire was on the second floor of the two-story building and was confined to an apartment closest to the street, Diaz said. Two men in an upstairs apartment in the back, however, were trapped by the blaze and had to be rescued through a window by crews using a long ladder. Crews had the fire under control by 6:33 a.m., Diaz said. Six people were displaced by the fire and are being helped by the American Red Cross, but no injuries were reported, Diaz said.